When I’m done catching up with all that earth shattering news, it’s about time to refill my coffee cup. As I’m waiting for the cup to fill (for some reason my coffee carafe only chooses to dispense my java through a tiny little stream. I could take the top off, but then I would lose all the heat. Life can be tough in the world of coffee.) I notice that a couple leaves on my house plants are dead. I take care of that then decide to water them. Of course, if I just water the ones on my kitchen window seal I’ll forget about all the others, so I’m off on a watering adventure. Then the puppy wants out. I’ve learned that a when puppy tells you he needs to go outside, he means right that very minute. If you dare dawdle…well, let’s just say you are going to have a mess to clean up. Of course, when the puppy needs to come back in he’ll be so adorable that you have no choice but to play with him for a bit. I warm my coffee back up and realize it’s back to me and Bob. Staring at each other. Each of us daring the other to come up with something absolutely brilliant to blog about. (Heck, at this point we’d settle for mediocre!) Then I notice the time. Holy Cow…what am I doing sitting here on the computer? I’ve got to hit the road if I’m going to get to work on time. This entry was posted in Blogging, Coffee, dogs, It's all about me!, Random stuff and tagged Blogging, Coffee, housebreaking puppy, houseplants, procrastination, puppy. Bookmark the permalink. I’m not sure…it could be ten years ago? 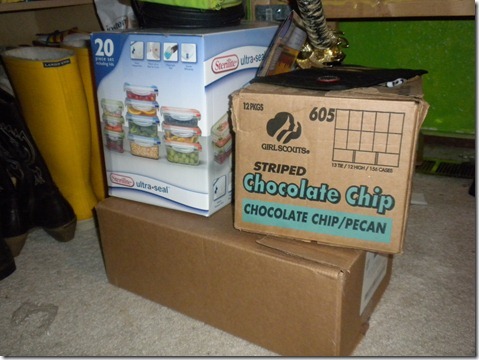 Good cookies…good boxes! Want to know how PJ was diagnosed ADD?? breakfast, home office in front of house, sit at desk, beautiful day, damn-the lawn needs to be cut supposed to rain tomorrow, change into yard clothes, stretch, out to garage, no gas in lawn mower, gas station, damn-blade needs to be sharpened, cut grass, lunch, more grass, water break, more grass, kids home from school, shower, back to office. oops-time to make dinner. Don’t be discouraged, happens to the best of us! LOL It’s so good to know I’m not alone! I usually wait until I have something to write about — otherwise, I’d NEVER get out of this chair!!! 🙂 Even in your avoidance, you make me laugh. oh, sounds all too familiar .. too many buttons on the toolbar that link me to other places other than my own blog! .. and then of course there’s the open container of home made somethings .. must have one of those too with the warmed up coffee! Oh, the perils of scatter-brain-ed-ness (yes, I just made that up). I’m sure we could come up with an excuse for it, but then we’d feel compelled to medicate, and then where would we be? I’ll tell you where we’d be – complaining about male pattern baldness or some other seemingly unrelated thing, but you know they are because medicines don’t just take care of your symptoms but cause another whole set. WHEW! I need a break! Now to go fix my daughter her lunch (yes, I know it’s nearly dinner, but I got sidetracked).